Intended use: Running - pronation control. 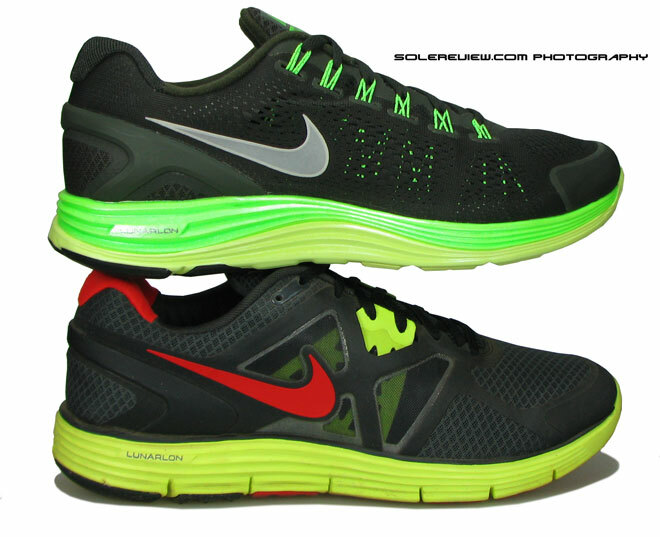 The Lunarglide 4 has major updates over its predecessor. High point being almost 10% lighter, made possible by less rubber on the outsole and use of lighter upper materials. 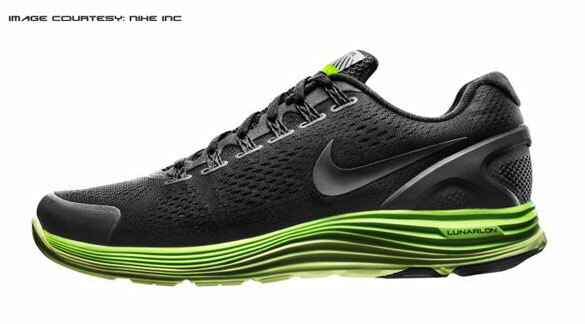 The Lunarglide 4 is now more of a motion control shoe than the Lunarglide 3 was, but will still appeal to majority of neutral runners. Fits true to size. Tester note: The 2012 LG4 might feel tighter when compared to the old gen LG3. The reason for this is the new Flywire cord system used in the midfoot. 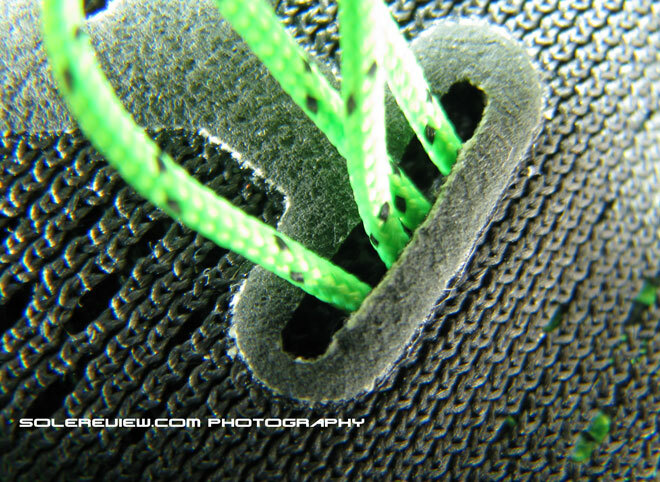 Re-lace the shoe without passing the laces through the Flywire cords; this opens up some space in the shoe. Images of the new Nike Lunarglide 4 started surfacing soon after Nike’s press release around product innovations for the London Olympics. The highlight of the press release was a long distance running shoe called the Nike Flyknit racer – it had an upper made out of a single layer of engineered mesh, and tipping the scales at a ridiculous 160 gms (5.6 Oz) for a size US 9. To put it in perspective -that’s exactly half of what the Lunarglide 3 weighs. While it is not a like-to-like comparison, it gives you an idea of how light the shoe is. But the reason I brought up the Flyknit racer is not because it weighs 5.6 ounces; it is because the Nike Lunarglide 4 draws heavily on design inspiration from the lightweight racing flat, and you’ll see those influences translating into new features on the Nike Lunarglide 4 . 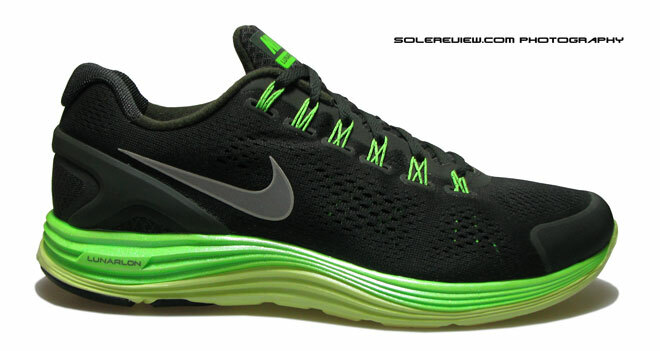 We gave top ratings to last year’s Lunarglide 3, and deservedly so. A good all round shoe which appealed to a large segment of runners; it combined overall comfort, ride and optimal ride dynamics in a well balanced package. 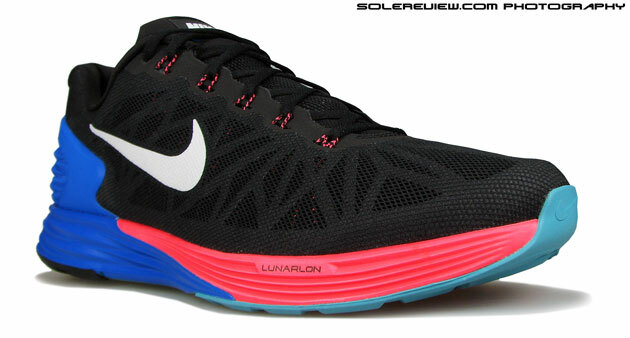 So when the news of the latest Lunarglide 4 came out, we really looked forward to the updates on what was already a great shoe. So here we are, and after having the Lunarglide 4 with us for over a fortnight now, we’d like to share our initial thoughts on the LG4! These are early days, and while we have put in some miles on the LG4, we will keep posting updates (scroll to the bottom) as days pass. The changes on the Nike Lunarglide 4 are major, so we’ll have to keep logging in miles to see whether our first impression of the shoe changes at all. So what are the major changes on the LG4?. First, there is a complete change in the sole architecture/setup – as a focused effort to deliver the dynamic support promise. 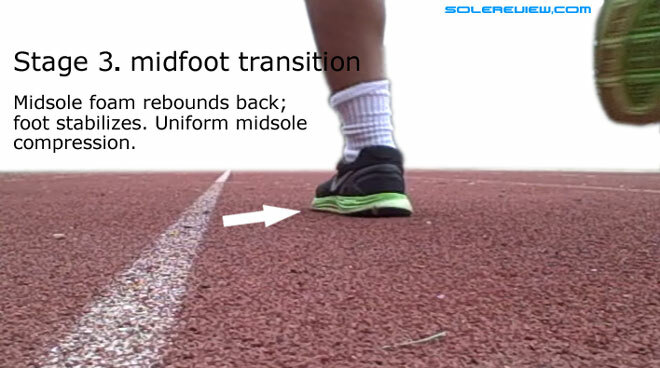 Second is the how the midfoot support system has been executed. And third is the use of single layered engineered mesh, based off the Flyknit racer. 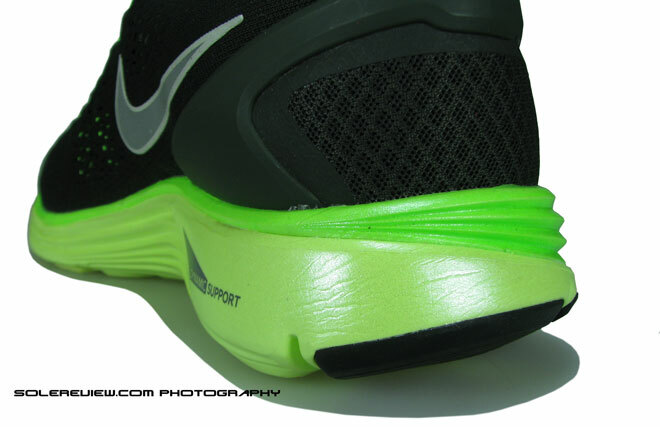 The Lunarglide 4 also goes through some serious weight reduction, losing 10% weight over the LG3. Let’s go run over these updates, shall we? Nike pitches the Lunarglide as a shoe with ‘dynamic support’, targeted at a wide spectrum of runners with diverse gait patterns. 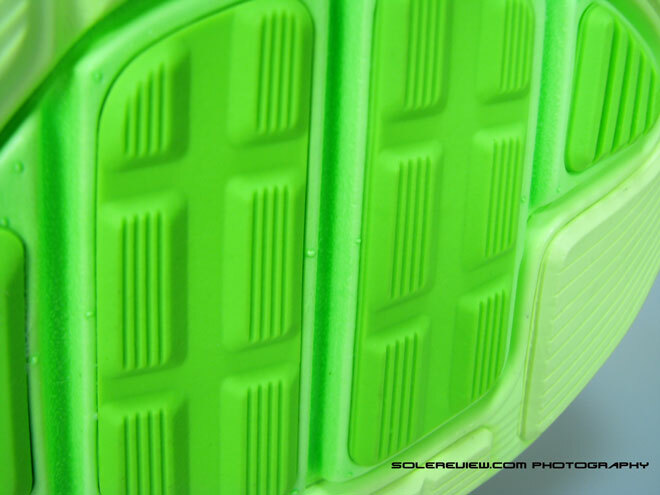 The core of this technology rests on the dual density midsole construction with a combination of soft + firm foam. Till the Lunarglide 3, a beveled piece of soft midsole foam (which Nike calls the Lunarlon) lay inside a firmer midsole cavity, which was also carved out at an angle. (See diagram above). So in theory, if a foot with a low arch rolled inwards during footstrike, the firmer foam worked to reduce that roll. It also targeted runners with a high arch where the foot needed to roll in; unlike traditional motion control shoes (say, like Nike’s own structure Triax), the ‘firm’ foam in the Lunarglide was relatively softer, so it could still work as a cushioned shoe. And if you were a neutral runner, the foot would not excessively roll to either side, so you ended up experiencing the sweet spot of the soft foam/firm foam setup. The Lunarglide 4 dumps the earlier setup which had the soft core foam as an insert; instead the soft Lunarlon foam unit breaks out of the cavity and is positioned over the firm midsole as an independent component. The illustration above shows the evolution of Nike’s ‘Dynamic support’ platform – in the new LG4, both the foam units are diagonally interlocked, and the redesigned configuration is meant for improved pronation control. This update has an effect on the ride; while overall cushioning has improved owing to the larger Lunarlon unit and feels uniformly well spread, it results in a decreased ‘give’ just under the base of your heel. 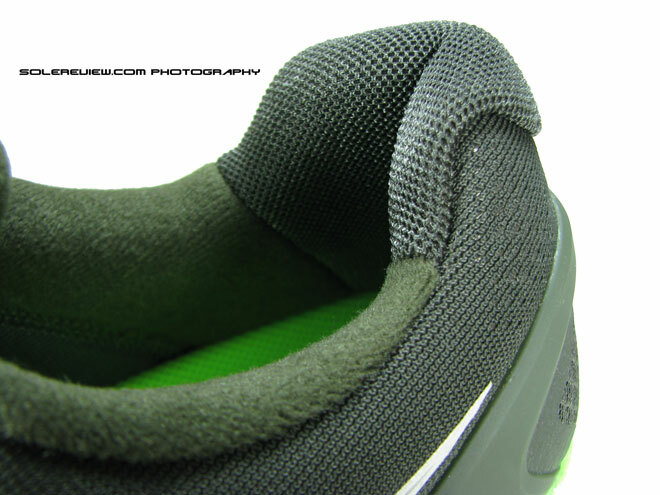 We’ve also noticed is that the heel tends to roll slightly outwards because the soft Lunarlon foam on the outer side. While it did not affect overall stability, we’ll back with a medium and long term assessment of the gait transition cycle experience in the LG4. Going by the comments on this review (see below), there is some amount of debate on how much that ‘roll’ is, so we are working on a video to clear the air a bit. But there will be unanimity on one attribute of the LG4 – it has evolved to become a shoe which feels much more cushioned than the LG3. The cushioning feels ‘springy’ than plush, which is a good thing because it keeps the foot from destabilizing. 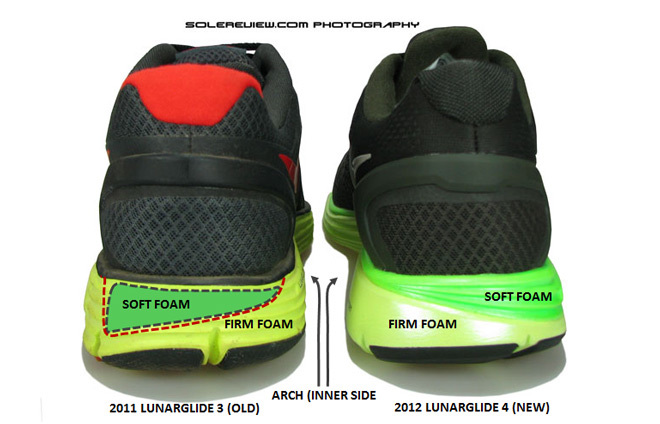 The Lunarglide 3’s midfoot support in the upper worked extremely well. They ran independent of the eyestay, and with some lacing pressure, one could create a custom level of fit. This June, the Lunarglide 4 does away with the straps, and in its place comes a network of multiple cords which run up sideways in the midsection. 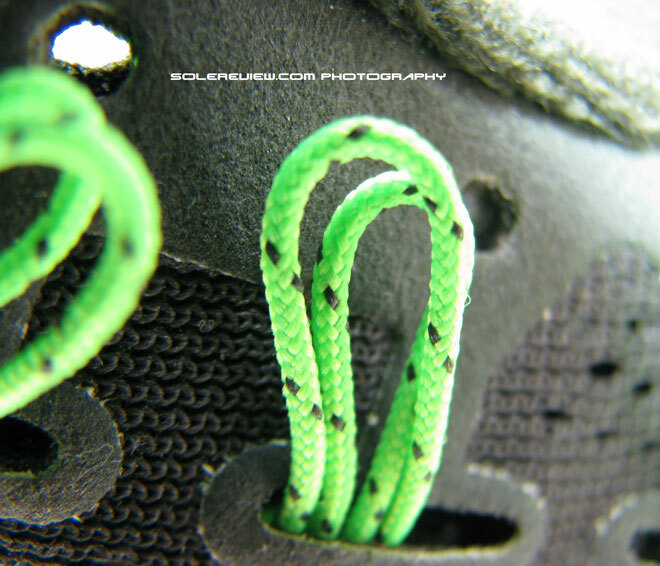 The cords are attached to the base of the upper, and extends out of the eyelets. Once the laces pass through them and are pulled up, the cords come together and apply pressure on the sides of the foot. There is a layer of synthetic leather fused on the upper which also doubles up as the eyelets for the laces to go through. During our first test run, we did not feel the midfoot Flywire cords performing the way they were supposed to, so we tried lacing a bit tighter. While it did help in wrapping the midfoot well, it also increased top center lacing pressure. Currently, the loops and the eyelets are almost at the same level, which means if you pull on the laces, the non-Flywire eyelets get pulled together and the fit gets too tight for comfort. This gives the impression of the LG4 having a tighter forefoot than the LG3 – fortunately, there is a workaround. 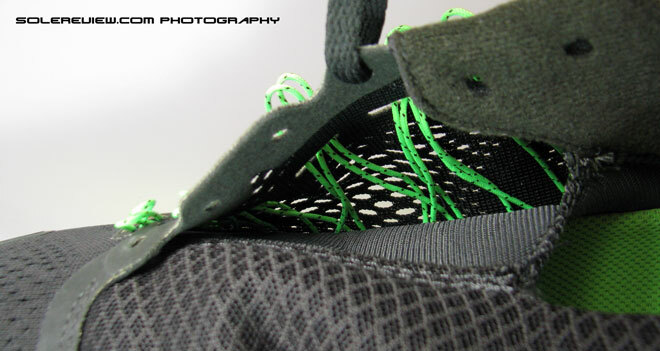 For the first few row of eyelets, do not pass the laces through the Flywire loops. Instead, pass it through the regular eyelets, and you will instantly feel the pressure ease off. Later, we wore the shoe without passing the laces through any of the Flywire cords, and the shoe became instantly more comfortable. We’ll post a picture soon to explain this better. There is a thin line between support and constriction, and we’re not sure the new Flywire system featured in the LG4 is the ideal solution. During our Lunarglide 4 weartest, we switched to the Lunarglide 3 several times to see how differently the midfoot strap worked. The Lunarglide 3 midfoot straps are easier to work on, and since they work independently of the eyelets, custom fit comes naturally. But we will log in more miles on the Lunarglide 4, and tell you how the Flywire cords hold up. The seamless sleeve construction of the upper carries over to the Lunarglide 4, so the shoe retains the glove like fit which we loved in the Lunarglide 3. The upper feels snugger than the Lunarglide 4, specially in the area where the little and the big toe comes in contact with the upper. Since both the LG3 and LG4 are built on the same last, the LG4 feels snugger in the forefoot owing to use of the Flywire cords. 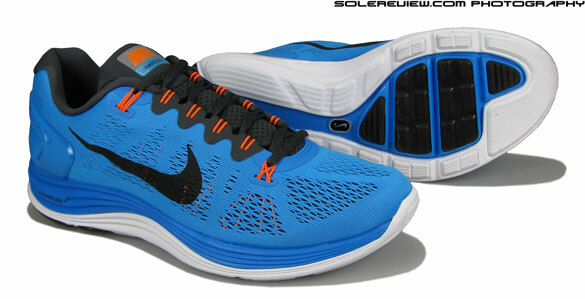 One thing which has gone from good to great is the use of the radical new mesh in the Lunarglide 4. Based on the Flyknit racer concept, the upper is made of a single layer mesh, which also is a simple component with a solitary seam at the heel area. From a manufacturing standpoint, this is quite a feat. This means each single upper piece would have to knit depending on the shoe size, instead of joining multiple pieces of mesh together. The mesh in the LG4 is engineered to allow for different sizes perforations/vents based on the areas of the shoe. So in certain areas, the mesh has bigger openings, while in other places it is a closed, tightly knit structure. Ventilation is excellent on the Lunarglide 4. We ran in pretty warm weather (90 degrees) and the Lunarglide 4 kept its cool, pun intended. 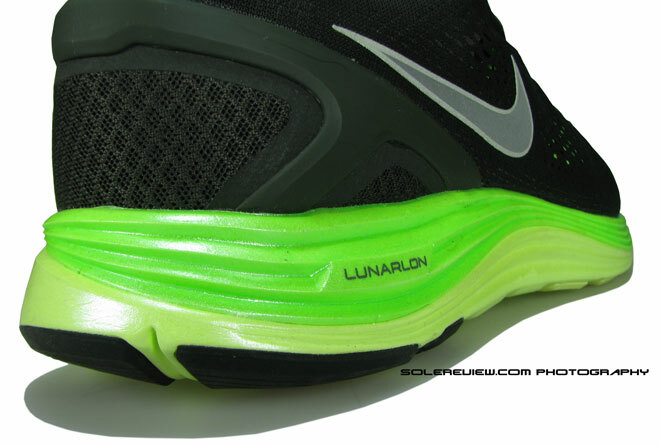 The Lunarglide 4 outsole gets a major update. 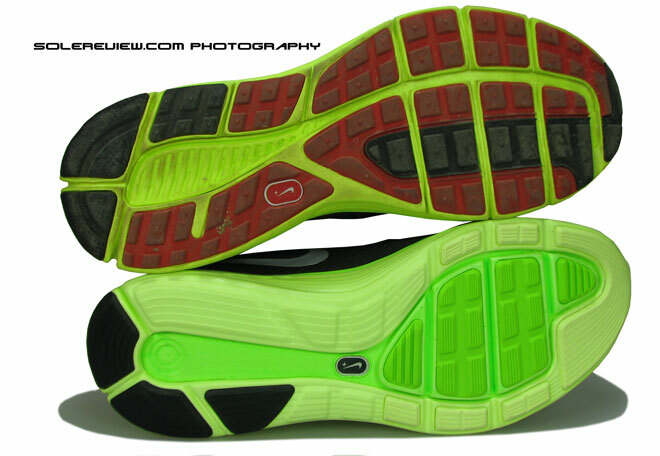 There is far less rubber covering the expanse of the outsole, which reduces the overall weight of the shoe. Our test shoe was a US size 11 and it weighed in at 296 grams (10.4 ounces), which when compared to the Lunarglide 3 (324 grams/11.4 Oz) is one whole ounce lighter. 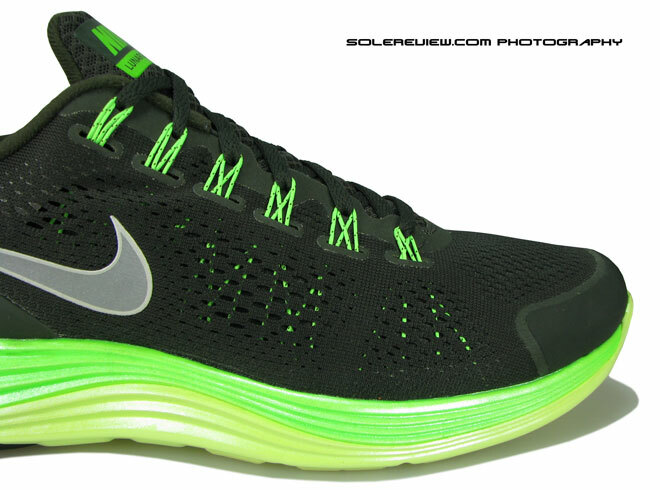 Flexibility sees improvement on the Lunarglide 4. In the third picture from the top, the flex grooves on the LG3 seems to be deeper when viewed from the side, the reality is that the Lunarglide 4 has deeper flex grooves running in the midsection. The perceptional difference in flexibility is barely noticeable during a run, but the LG4 does flex better when stationary. 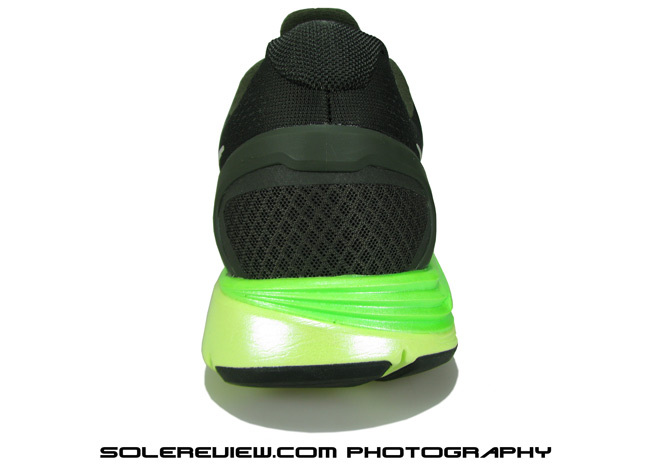 Update, Sep 21st, ’12: There has been some negative feedback by runners (see comments below) with respect to the durability of the LG4 outsole; since lesser pieces of rubber cover the heel area, the uncovered foam area (refer to picture) has a tendency to wear out faster than the Lunarglide 3. Other carry over features from the Lunarglide 3 include the two fabric padded collar lining which does a great job of keeping the heel from slipping, the molded sockliner with ridges to help wrap under the base of the foot and the molded heel clip which adds to stability during the run. The molded heel clip has also been redesigned on the LG4 to open up more space, increasing ventilation in the process. The new Lunarglide 4’s purpose is much more defined – that of a motion control shoe, but should be able to retain the Lunarglide faithfuls. The Lunarglide 4 is a lightweight, well cushioned and breathable running shoe – and to top it, they look rad. 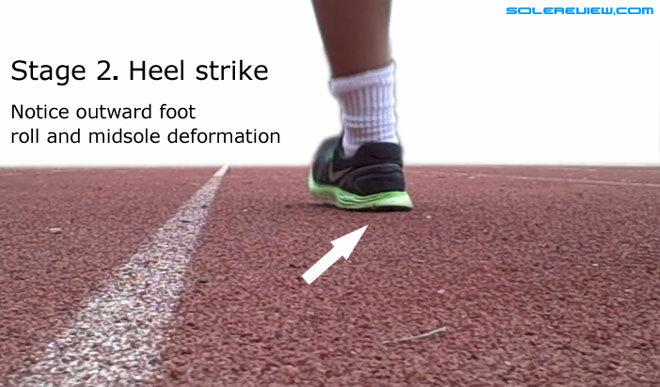 It is very clear that the heel does roll outwards as soon as the heel hits the ground – the softer(green) foam on the outside undergoes a higher degree of deformation as compared to the inner side. This leads to a temporary roll of the heel; but as soon as the weight is transferred to midfoot, the foam quickly rebounds back, preventing loss of stability or balance. 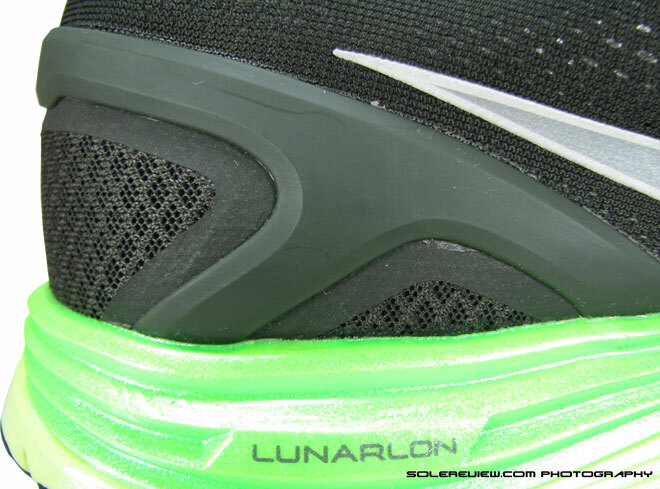 The Lunarlon foam is much more resilient than traditional midsole foam, so the foot does not sink in or wobble. Stability is definitely not an issue. We’ve also put in a lot of miles in them since our first review – our verdict is that we would recommend the LG4’s to neutral runners. Holiday 2012 seasonal model update – The Nike Lunarglide+ 4 Shield. Like last year’s combo of the regular Nike Lunarglide 3 and the winterized Shield version, this October also saw the introduction of the new Lunarglide 4’s ‘Shield’ version. The new, but incorporating the now familiar concept, Lunarglide 4 shield is meant for running cold/damp weather conditions, with an internal sleeve which is water resistant, yet reflective. The pro’s of the shoe really (and literally) shines out when you have miserable weather for company, but the benefits might not be apparent if you plan to run in warm weather. Like last year’s Lunarglide 3, the water resistant and reflective upper ‘Shield’ upper cuts down on ventilation when running in the sun, and weight goes up by a few grams.